For degree courses in hospitality management there is no better choice. Why? The Emirates Academy of Hospitality Management is located in Dubai, the fastest growing tourism destination in the world. For industry exposure during studies and job opportunities afterward, the Academy’s locale is unsurpassed. It is also an exciting and dynamic place to live, with sun, sand, international sports and cultural events, and great shopping. Our students fully enjoy both the professional and personal opportunities afforded by this vibrant city. An excellent reason to choose The Emirates Academy of Hospitality Management is that we are part of the Jumeirah Group, the international company behind five-star hotels like the Burj al Arab. Jumeirah guarantees jobs to The Emirates Academy of Hospitality Management’s top graduates. During their studies Academy students are exposed to the inner workings of the world-class Jumeirah hotels, and many students do their internships in Jumeirah hotels in Dubai or overseas. Add to that our highly qualified faculty, world class facilities and multicultural student body, and you have a near perfect setting from which to launch your career in hospitality or tourism. The Emirates Academy of Hospitality Management and the Ecole hoteliere de Lausanne - is the fulfillment of a vision to provide the best in new hospitality management personnel to an industry hungry for talent. 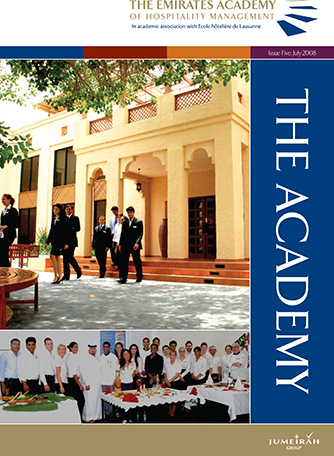 The integration of proven academic excellence together with Jumeirah's incomparable property management strengths provides students of The Emirates Academy of Hospitality Management with an unrivalled opportunity - the best academic techniques and practical experience in the most inspiring hotel, restaurant and recreational environments.